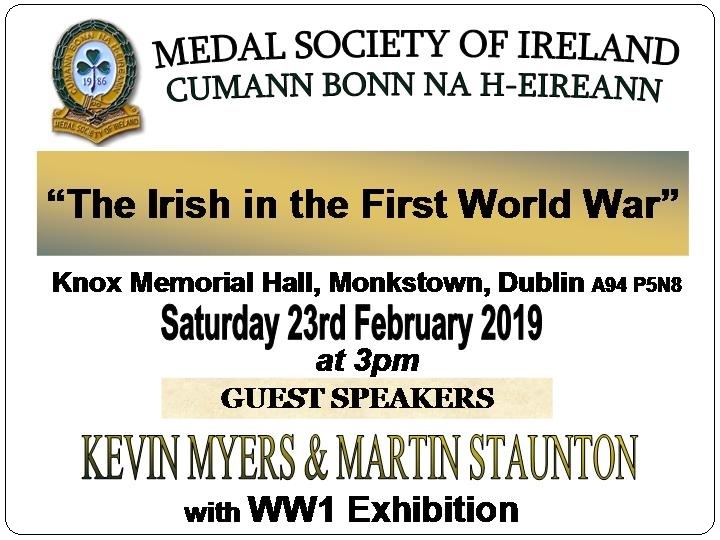 Kevin Myers is a well known Journalist, historian and autobiographer with a particular interest in the First World War. He has done much to revive and sustain the memory of those Irishmen who died in that bloody conflict, and this he did at a time when it was not popular to do so. His perspective is sometimes controversial but always accurate and thought provoking and it is always a pleasure to hear him speak. Martin Staunton works as Senior Finance Officer for the United Nations High Commissioner for Refugees in Budapest. He was educated at Blackrock College and at UCD. Martin has a profound interest in history with particular emphasis on the First World War. He is a foremost authority on the campaigns and personnel of the Royal Munster Fusiliers and has spent many years collecting data on the regiment. A gentleman and a scholar, who really knows his subject. Which one of them is the gentleman, and which the scholar? The gentlemen, the self-drescribed anti-Semite, "Africa has giving nothing to world but aids." well excepet all their natural recsources the Western powers during the race for Africa & right up to today stole & steal. Has nothing but contempt for Irish people because not enough (even though a big lot turn out) to WW1 comemorations. I really do hate seeing anyone lose their jobs but this vindictaive, evil little man should have been fired 15 years ago, it was the only time I felt joy at someone getting fired. Last edited by BalcombeSt4; 12-02-2019 at 06:03. Hope the keyboard is ok after the vicious hammering it got there. I’d bet that poor old Balcomb has never been to Africa. In the corruption stakes of today, after decades of self-rule, Sub-Saharan Africa is the most corrupt region in the world with its countries averaging just 32 points out of 100 (using Transparency International’s guidelines). It is followed by Eastern Europe and Central Asia (with an average score of 35 points) and the Middle East and North Africa (39 points). Does he really believe that the DRC is really democratic or a republic? Answer : In a Swiss bank account’. What does this have to do with anything? Everybody knows Nigeria is the most corrupt country in the world (probably). It probably doesn't help that the US & the rest of the West prop up these dictators & then sell them weapons to keep down their own people because the arms trade as we all know is highly profitable. You get your hand chopped off for robbing bread in Riyadh, but hey, those are our kind of exremtists. Anyway it' not like we can point to many fingers, after all we did invent cronyism. Last edited by BalcombeSt4; 13-02-2019 at 18:25. Anyway it's like we can point to many fingers, after all we did invent cronyism. What now? The Irish invented cronyism? A defence of Africa marred by a general attack on paddy has left this argument in moral tatters. Myers has written plenty of clumsy controversy generating journalism. But to address your points, he claims he didnt use that exact phrase in his article (AIDS), it was added as a headline by editorial staff. I don't believe he ever described himself as an anti-semite either. You are either referring to his article about Jewish people being good at negotiating salaries? Or his "holocaust denial" semantics about how not all the "holocaust" victims were burned. Ridiculous stuff, but not quite as you portray it. Africa, generally speaking, has among post-colonial societies, has had far more failures when compared with other countries and regions. e.g. Asian former colonies. The question of "how to get out of this mess", should always be of more importance than "how did we get into this mess?" ("who did this to us?" etc). Maybe don't go to hear him speak if you don't like him. Well one of the Alt keys is gone missing but I have two Alt Keys so who cares. And I didn't even move on to his "Little Bastards" or "The Black & Tans legacy has been ruined by lazy people." articles. It's funny seeing him described as a Journalist & Historian, when he actually is a Propagandist, a very good Propagandist, like the Irish Goebbels (who I'm sure he'd have a lot in common with). I remember Myers wrote an article about Irish people in Ireland during WW2 supporting the Germans (never misses a chance to have a go at Ireland, as he wishes he was born in Belgravia) like dock workers giving German U-Boats fish & fags & **** like that & that the majority of the country supported Germany, I'm not sure how he knew that, but Myers probably would have been part of the German supporting majority. Fintan O'Toole, who I also sometimes throw into that Lib-Con Dublin Metropolitan elite with the likes of Cusack & Dunphy, O'Toole wrote a great article about why Myers was actually fired, he was fired for the anti-Jewish stuff, which wasn't that bad compared to his attacks on the BBC radio people (forget their names) as women, it is a whole lot more acceptable to slam women, than Jewish people, and that's the mistake Myers made, he's usually very careful about who he bullies, single mothers, starving Africans living in poverty, refugess, Palestinians, dead Republicans basically anyone with out a voice to fight back, which is what a bully does, and he is a bully, but luckily Jewish people can defend themselves and they called him out on his bullshiiiit & using hyperbole every senetence. The only reason the Jewish Council of Ireland came out in support of him is because he always takes swipes at Palestine & defends Israel. A good comparison is Ruth Dudley Edwards, has basically the exact same views as Myers, she hates poor people, single mothers, loves Israel, loves Unionist, hates Republicans etc... they should have got married. But she's not a bully, she actually came to the Falls Road and debated with former PIRA Tyrone Commander Tommy McKearney, who took part in the 1980 Hunger Strike lead by Brendan Huges, he lost 3 brothers, one was blown up in 1973, on was killed at Loughgall & the only brother who was not in the IRA was shot by the UVF in 1992 along with his uncle. She also debated George Galloway & Gerry Kelly, for people who don't know Gerry Kelly bombed the Old Bailey in 1973 & lead the 1983 Maze mass escape & set up an ASU in the Netherlands, that killed 3 British RAF men. So RDE will at least sit down & debate with these people she roats but Myers couldn't do that because he's a bully. When the forum is quiet I think the guys at Boards want to kick-start it. They then write a load of old s#ite and post it under an alias to get a discussion going. I cannot believe that this country, bad an all as it is, can ordinarily contain writers of such twisted waffle. I'm not even going to waste my time responding to pub republican one-trick ponies. It's getting boring at this stage. Mod: If you disagree with a post you can reply to it, if you have a problem with a post report it and cut out the snarkiness. Mod: You need to tone down your posting style if you are to keep posting here BalcombeStr, it is needlessly aggressive.